The transmission lines are like the arteries of the power system. Transmission lines are important part of power network and are also loosely called as power lines. It should be remembered that the term power line also includes distribution line. As in this article our main concern is transmission line so we will not use the less specific term power line. Transmission lines act as medium for carrying bulk energy from one substation to other. Different voltage levels are standardized by energy authorities of the respective countries for transmission lines to operate. The electric energy transmission is carried out at High and Extra High Voltages (EHV). Some common AC transmission voltage standards are 110 kV, 115 kV, 132 kV , 138 kV, 220 kV, 230 kV, 345kV, 380 kV, 400 kV, 500 kV, 765 kV, 1100 kV etc. . Voltage above 220 kV is usually referred as Extra High Voltage. For very long transmission line, transmission at High Voltage DC (HVDC) has proved to be economical. HVDC transmission also has several other advantages. 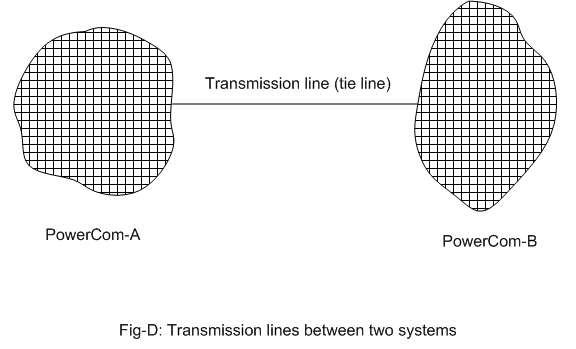 Here we will mainly concentrate on basics of AC transmission. Here we will remain silent about HVDC transmission. The electric substations are interconnected by transmission lines and form a network. It is also called Power Grid or simply Grid. The modern Grid is very large. It spans regions and countries. The transmission lines can be constructed over head or under ground. The overhead lines are bare conductors with proper clearances from earthed structures and between the phase conductors. The underground transmission is carried out by means of cables. Gas insulated lines are also increasingly found as transmission medium. Here we will discuss about over head transmission system which is the primary means of electric energy transmission. The over head transmission is cheaper in comparison to underground transmission. The selection of conductor for transmission line depends on several factors. The main factors being electrical and Mechanical it should also be economical. The corrosion of conductor due to environment is also kept in mind. The transmission line should be able to carry the electrical load and should be strong enough to sustain the mechanical stress under different conditions. Obviously the transmission line is required to have good conductivity and high strength to prevent snapping under normal and abnormal conditions. Although copper has high conductivity it is not used for transmission purposes primarily due to its higher cost and being heavier than aluminium. Aluminium is used because it is cheap, light and of course has good conductivity . But because of low strength, aluminum alone is not used for transmission purposes. Instead of a single rounded conductor stranded conductors made from conductors of smaller radii are used. The stranded conductor has few advantages over single rounded conductor as listed below. The stranded conductor has larger surface area so the electric field strength near the conductor surface is reduced. As a result the stranded conductor is less likely to experience corona. Corona is the phenomenon that happens due to the ionization of air adjacent to the conductor surface due to high electric field strength. The stranded conductor is more flexible than a single rounded conductor of equal capacity. For higher capacity conductor the conductor diameter may become large enough that use of one single conductor of large diameter becomes non-flexible. The strength of stranded conductor is increased considerably by using few strands of steel or alloy core at the center as required. In case of AAAC all the strands of conductor are alloys of aluminum. So the conductor has good tensile strength in comparison to pure aluminum. The ACAR conductor has central core comprised of strands of aluminum alloy and the surrounding strands are of aluminum. 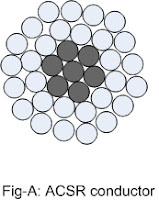 The ACSR conductor has a steel central core of few strands and surrounded by aluminum strands in one or more layers. The alternate layer of strands are laid in helical form would in opposite direction (otherwise how can the strands remain intact). The steel core provides the strength and surrounded aluminum conductors carry the current. So the ACSR satisfies the requirement of a good transmission line, i.e. it has both good conductivity and sufficient strength. More tensile strength in ACSR results in less sagging so greater span length between towers. You will mostly find ACSR conductors for high voltage transmission purposes. In Fig-A is shown the cross section of a ACSR conductor. It has seven strands of central steel core surrounded by two layers of aluminum conductors. In high capacity transmission lines instead of one conductor (ACSR/AAAC conductor) per phase, two, three or four conductors are used. This is called bundled conductor. Here the conductors are separated by spacers. The two conductor bundle is called twin conductor bundle. 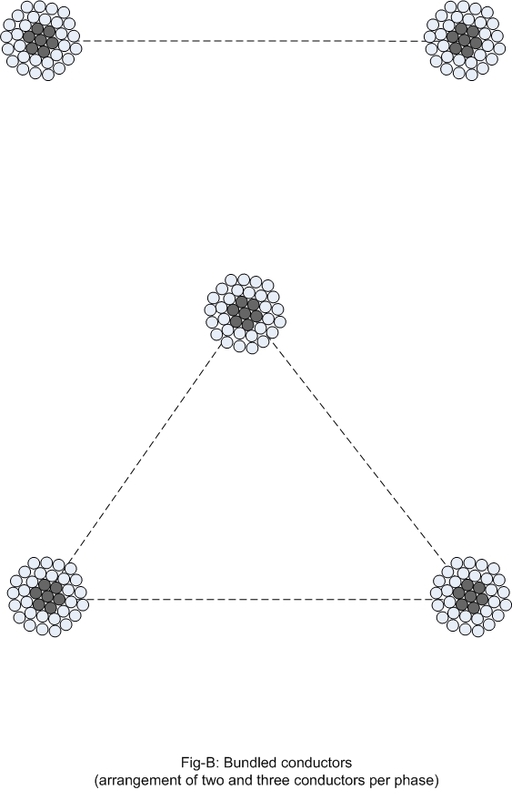 When three conductors are used they take the position of vertices of equilateral triangle, if four nos of conductors (quad conductor) are used they take the position of the corners of a square. In Fig-B below is shown twin and triple conductor bundles. Main benefits of conductor bundling. the transmission losses are reduced due to reduced resistance. The reactance of the line is also reduced so the transmission capacity of the line is increased. The main benefit is that the line corona is reduced due to increase in surface area, so reducing the loss due to corona. Reduction in chances of corona also means reduction of chances of interference with communication networks. See figure-B for bundled conductors. The need for construction of transmission line mainly falls into one of the four categories mentioned below . Two already existing HV or EHV substations of the grid are interconnected by transmission lines for strengthening the network. 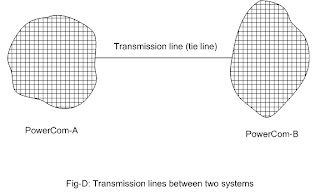 It is usually seen that two adjacent power transmission companies agree to interconnect their systems by tie lines. 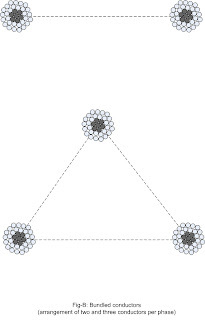 By interconnecting the two adjacent systems, power needed by one company as agreed by both sides( or emergency requirement) is supplied by other side. It is done to improve the reliability and stability of the systems. 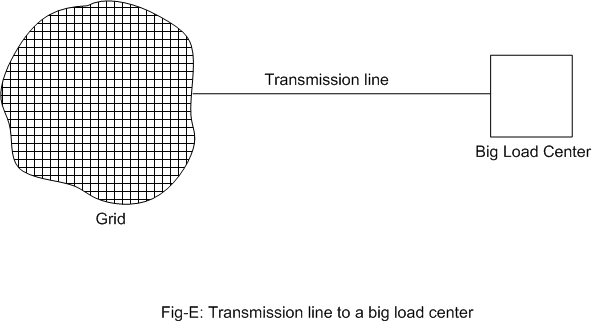 See Fig-D .
A transmission line may be required to be built to serve an upcoming large load. 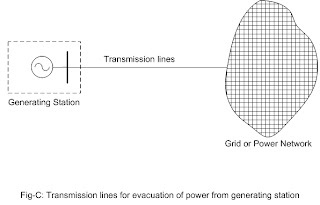 As an example if a new industry and/or its township is built (usually in new place) then transmission line is built to feed the distribution network of new industry/township from the existing grid. The power is received at the receiving station of load center and stepped down by transformer, which feeds the primary high voltage distribution network. See Fig-E. To enhance the availability of supply the receiving station at load center may be connected to two separate substations of the Grid forming. 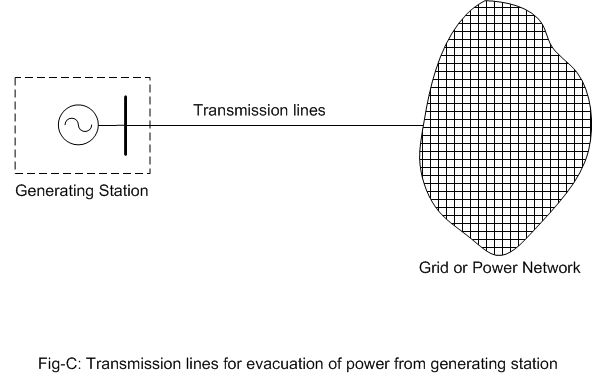 For planning transmission line addition or alteration, computer simulated load flow study is carried out . The study is carried out for several alternative configurations under peak and off-peak loading and generation conditions. From several alternative configurations the most suitable one is finalised for construction.